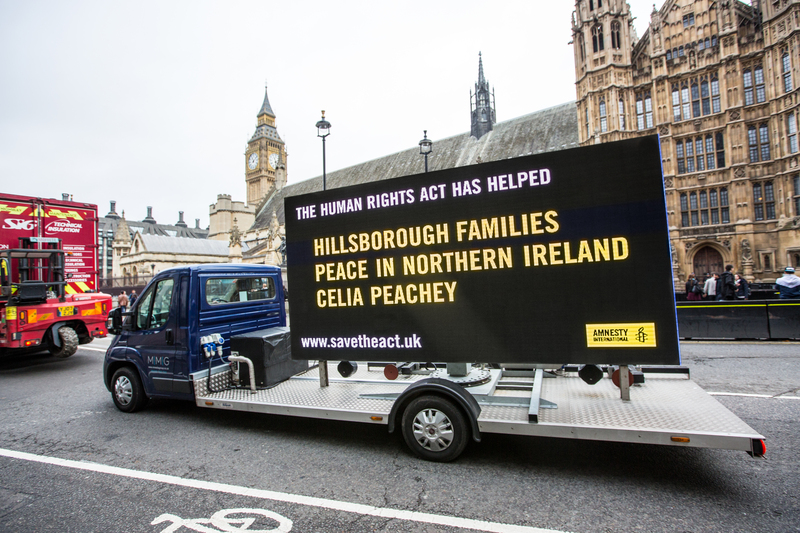 We’ve just come to the end of two weeks of action to save the Human Rights Act, and the response has been brilliant. More than 158,000 people have now signed our petition asking Justice Secretary Liz Truss not to turn universal freedoms into privileges for a chosen few by scrapping the Act. Hundreds have also tweeted Truss directly, calling on her to defend it. We always knew that human rights had the power to provoke passionate debate, but we never expected the campaign to create controversy before it had even got going. Yet that’s what happened when Network Rail pulled our adverts at the last minute for being ‘too political’. The simple ads, which highlighted people the Act had helped, were set to run in train stations in Liverpool, Edinburgh, Glasgow, Manchester, Birmingham and London’s Waterloo and Victoria. For us, basic human rights are never and should never be a political issue, and we released a statement expressing our dismay at the decision. This was swiftly picked up by The Guardian, The Independent, The Mirror and others, giving unexpected extra momentum to the opening hours of the campaign. Our campaign featured powerful stories from people who have used the Human Rights Act to pursue justice and achieve protection and dignity. Becky Shah’s mum Inger, Barry Devonside’s son Chris, and Steve Kelly’s brother Mike were all killed in the crush at Hillsborough football stadium in 1989. In three emotive new films, they described how the Human Rights Act helped them expose the truth about what happened. After a 27-year fight for justice, the Hillsborough families used the right to life enshrined in the Act during the wide-ranging second inquest into the deaths of 96 football fans. The inquest found that, contrary to previous reports, the deaths hadn’t been accidental. It concluded that the Liverpool fans weren’t to blame for what happened and had been unlawfully killed as a result of failings by the police, ambulance services and others. 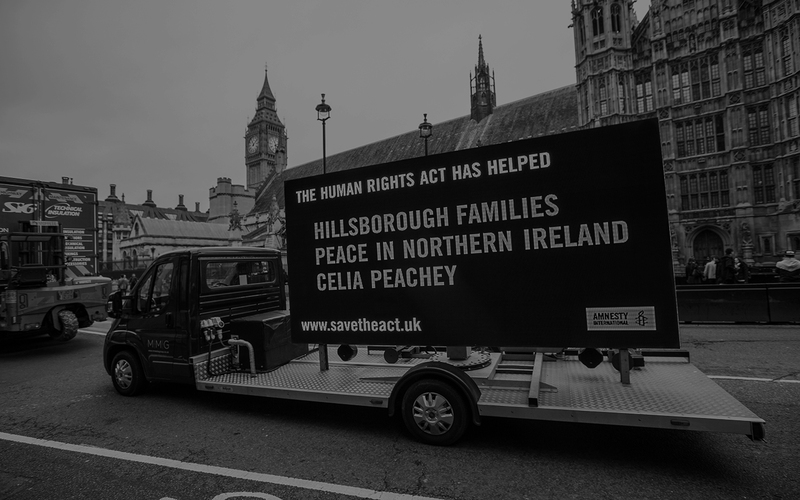 Before this part of our campaign, 70% of people who responded to our poll had been unaware of the crucial role of the Human Rights Act in this historic case. But Barry, Becky and Steve’s powerful testimony was shared thousands of times on social media, reaching more than 2.5 million people. And through interviews with The Metro, The Guardian and others, they brought home the importance of human rights to millions more. Human rights are at the heart of the historic Good Friday Agreement that brought peace to Northern Ireland after 30 three decades of violence. Yet at the start of our campaign almost three-quarters of people we spoke to were unaware that the Human Rights Act is a cornerstone of the peace deal. We worked with key voices from Northern Ireland to highlight the crucial importance of the Act. Victims campaigner Alan McBride, whose wife was killed by an IRA bomb, and peace negotiator Professor Monica McWilliams, explained the part the Act played in securing the peace deal in a video and in articles in The Times and The Belfast Telegraph. The Human Rights Act is a powerful tool for individuals too. In a blog on the Conservative Home website, Celia Peachey explained how she used it to expose serious police errors after her mother was killed by a violent ex-partner. Others whose stories we highlighted during the campaign included Gary McKinnon, a British man who has Asperger’s syndrome. He was threatened with extradition to the USA after being accused of hacking into NASA and Pentagon computer systems to search for evidence of UFOs, despite evidence of the harm that transfer would do to him. Theresa May was only able to block the extradition because of the Act. The Act also helped Jan Sutton, who has multiple sclerosis, to campaign for more care funding from her local Council after years spent trapped in bed for most of the day. As a result, Jan’s quality of life has improved immeasurably and she is now an active campaigner for human rights. Frank and Janet Robinson used the Act to expose hospital errors when their son died after a cycling accident. Doctors at Mid Staffordshire Hospital sent John Moore-Robinson home after failing to diagnose a ruptured spleen. He died hours later. Without getting to the truth, no lessons could be learned. Now is a crucial time to stand up for the Human Rights Act. With people’s fundamental freedoms under attack around the world, we must defend the safety net that’s built into UK law. We’ll be taking our campaign forward into next year and finding more opportunities to get these powerful stories out to as many people as we can.